Have you heard the phrase “You are what you eat“? According to Jennifer J. Baumgartner, PSYD, “You are what you wear.” Even though clothing can be used as a tool to express yourself, it can also reveal insecurities you’d wish to hide. Now that you know this, you have two choices. One, stop reading and continue searching the web. Two, learn how to over come inner turmoil and take back control of your clothing. If you picked option two, Jennifer J. Baumgartner, PSYD is ready to help you. She is only one person. 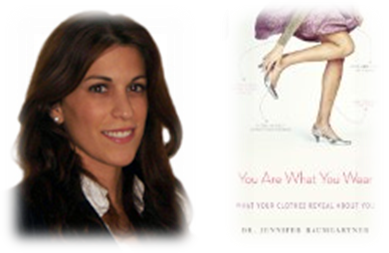 fortunately for us, Dr. Baumgartner published an excellent book called, You Are What You Wear. Though these titles are humorous and self-explanatory, they are relatable. Each chapter covers a time that may or have occurred in a woman’s life. A lady of any age can appreciate this book, because there is something for everyone. Each chapter comes with examples as well as checklist. These can be used for self-analysis. Today’s woman doesn’t have time to be everywhere at once. This book helps her take care of herself without losing sight of what’s important. Though professional help is a good option, it can be costly. You Are What You Wear is $16.00 US/ $18.50 is a cheaper alternative. Besides its excellent tips and Do-It-YourSelf Wardrobe Analysis, You Are What You Wear shows how fashion relates to other fields. Psychology and Fashion are not usually used in the same sentence. Though Psychology is a science and Fashion is an art, Psychology can be seen from an arts perspective. Amongst other things, Psychology is a study of human behavior. The clothing choices and shopping habits of women are habitual. As a result, they can be analyzed from a Psychological point of view. As a result, fashion can be a part of the scientific world. Dr. Baumgartner saw this connection and brought this information to light. For those who do not know, this is not the first time psychologist have analyzed the fashion industry. In fact, Elizabeth Bergner Hurlock published Psychology of Dress: An Analysis of Fashion and Its Motive in 1929. This was over ninety years ago, it was time for an update look at fashion and how people’s insecurities relate to them. Also, Hurlock’s book is focused on clothing and it’s relations to social class. She is not looking at the issues Dr. Baumgartner covers in You Are What You Wear. However, publications like Psychology of Dress has paved the way for today’s books an articles that interlock fashion with psychology. Overall, this books is great for any age group and can help you confront your inner turmoil. If you have a chance, search for this book at your local library. Even though my local library is the Hoyt Library, I was able to borrow it from The Ousterhout Free Library. Both public libraries are located in Luzerne County. I can borrow from any library in Luzerne County. It never hurts to look.